Guaranteed Adhesive Breast Silicone Sheet Scar Treatment . Includes Washable and Reusable Silicone sheet. Two vertical breast pieces for healing scars after breast surgery. Intended for the incisions around aerola and down the middle of the breast. Most patients wear ReJuveness breast reduction pieces under a post-operational bra or under a simple sports bra while sleeping. Do not apply to open wounds unless sterilized. Reduction mammoplasty. round block mammoplasty. Breast reduction. breast augmentation . periareolar incision. Vertical scar. lollipop incision, inferior pedicle. anchor incision inferior pedicle flap technique, breast lift surgery. Apply your silicone sheet after the wound is dry and not oozing any liquid. Apply for minimum of 8 hours per day up to a maximum of 48 hours of continuous treatment, adjust wearing time based on comfort. After each treatment period wash the sheeting with mild soap and air dry. The longer you wear a silicone sheet the faster your results will occur. 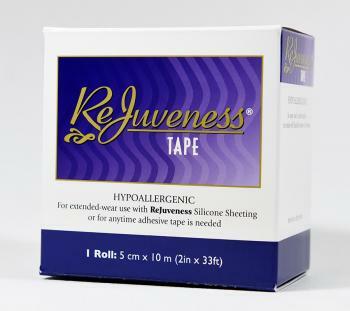 Apply silicone sheeting utilizing the adhesive side the non-adhesive side can also be used for healing your scar. Sheeting should overlap your scarred area by at least 1 cm (1/4") all around. Tape can be used in addition to adhesive on the silicone sheet to hold silicone in place over scarred area. Average healing time is 1 to 3 months, continue treatment until scarring stops improving.